The Bentayga's 4.0-liter V-8 diesel offers 429 hp, which can push the SUV from 0 to 100kph in 4.8 seconds and deliver a top speed of 270kph. Bentley’s first diesel-powered car -- which arrives in early 2017 -- will also be the most affordable and most economical version of its new Bentayga SUV. The Bentayga diesel will start at 146,500 euros in Germany, well below the 208,500 euro starting price for the version powered by a W-12 gasoline engine. Volkswagen Group’s British subsidiary says the new model produces 210 grams of CO2 per kilometer and uses 7.9 liters of diesel to travel 100km, compared with 296g/km of CO2 and fuel consumption of 13.1 liters per 100km for its gasoline-powered sibling. While Bentley customers aren’t traditionally concerned with saving money on fuel, the company claims the quoted 1000km (620-mile) range with a full tank is considered something customers will appreciate because it reduces the amount of time Bentayga diesel owners will spend at fuel stations. The large SUV shares its 4.0-liter V-8 diesel with the Audi SQ7 SUV. Both vehicles offer 429 hp, which can push the SUVs from 0 to 100kph in 4.8 seconds and deliver a top speed of 270kph. By comparison, Bentaygas with the W-12 engine can travel 0-100kph in 4.0 seconds and offer a top speed of 301kph. Bentley claims the diesel model is fully compatible with company values. The car has “immense power, grand touring capabilities and superb refinement -- this is a true Bentley,” CEO Wolfgang Duerheimer said in a statement. As with the Audi S7Q, the twin-turbo diesel uses an electric supercharger to boost torque at lower speeds. The supercharger runs off a 48-volt electrical system that can also power an optional electric anti-roll system. ZF Friedrichhafen supplies the eight-speed automaker transmission used in the Bentayga and S7Q. 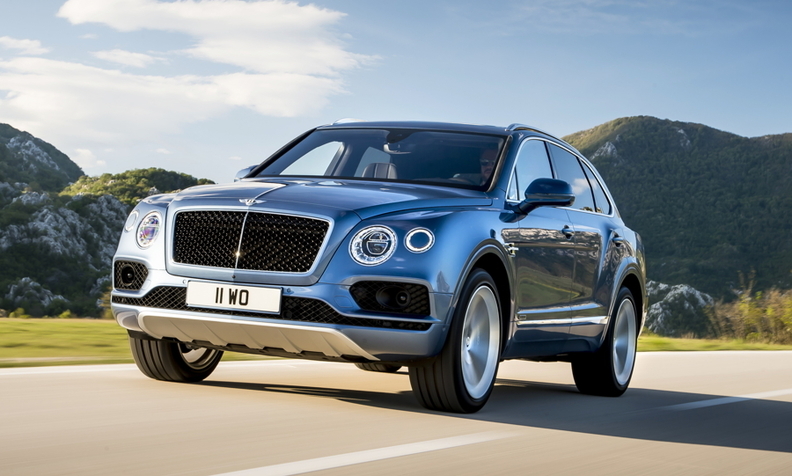 Outside of Europe, Bentley will sell the Bentayga diesel in Russia, Australia, South Africa, New Zealand and Taiwan. Shipping to those markets will start in summer 2017, the company said. The diesel Bentayga won’t be offered in the U.S.
Bentley has said it will also sell a hybrid version of the Bentayga starting in 2018.